Once upon a time, mercury was a familiar substance in virtually every home. Often called quicksilver, it was found in thermometers, mirrors and first aid kits (remember Mercurochrome? ), but when its many dangers became known, it faded from view and assumed a more hidden role in industrial processes, electronics manufacturing, and fluorescent light bulbs. It is the most toxic non-radioactive element on Earth, and it’s swimming in our oceans. Have you begun to worry about eating fish contaminated with mercury? Do you avoid some forms of fish, or restrict your portions? Do you carry around one of those little wallet size crib cards so you know which kinds of fish might be safe and which are not? Maybe you should, since all fish contain at least trace amounts of methylmercury. 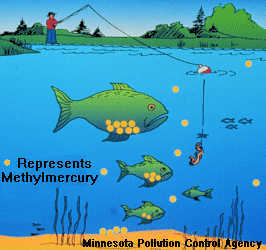 Methylmercury [CH3Hg] is the most toxic form of mercury, and the form which is absorbed by fish. 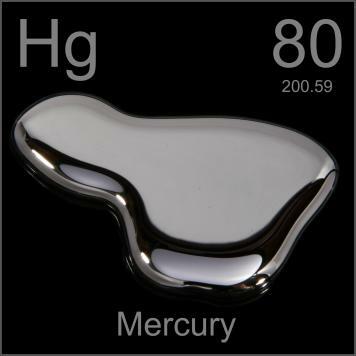 Methylmercury is created when mercury, in water, is subjected to sulfate-reducing bacteria which metabolize mercury to form methylmercury, the form that is available to living systems. In both children and adults, high levels of methylmercury can damage the brain, heart, kidney, lungs and the immune system. More advanced poisoning shows up as mental retardation, cerebral palsy and dementia in adults. Methylmercury is particularly damaging to developing embryos, which are five to ten times more sensitive than adults. Elemental mercury, Hg(0), the form released from broken thermometers, causes tremors, gingivitis, and excitability when vapors are inhaled over a long period of time. Although it is less toxic than methylmercury, elemental mercury may be found in higher concentrations in environments such as gold mine sites, where it has been used to extract gold. Concentrations of mercury in feathers of fish-eating seabirds from the northeastern Atlantic Ocean have steadily increased for more than a century. In North American sediment cores, sediments deposited since industrialization have mercury concentrations about 3-5 times those found in older sediments. A new report released today by the Ocean Alliance found that sperm whalesfeeding even in the most remote reaches of Earth’s oceans have built up stunningly high levels of toxic and heavy metals. The findings spell danger not only for marine life but for the millions of humans who depend on seafood. “You could make a fairly tight argument to say that it is the single greatest health threat that has ever faced the human species,” said biologist Roger Payne, founder and president of Ocean Alliance. How does the mercury get into the fish? Although mercury occurs naturally (from volcanoes, forest fires, weathering of rocks and evaporation from soil and water surfaces) the main culprits are considered to be power plants and other industries that burn coal. The mercury from smokestacks not only contaminates nearby water bodies, but also those far from the source. Once emitted, some mercury can remain circulating in the atmosphere for up to one year. When the mercury comes into contact with oxidizing chemicals such as ozone, it becomes water soluble. It is in this form that it is deposited via rain or snow, and finds its way to our waterways. There microorganisms convert it to methylmercury, the form that is especially toxic to humans and wildlife. Then it can evaporate and the cycle can continue, distributing mercury wherever rain or snow falls. This makes mercury pollution a truly global problem. But since this is a blog about textiles, it’s important to point out that mercury is also used in textile processing. You may know that mercury was used extensively in felt making operations in the 18th century. Workers developed trembling (“hatters shakes”), anxiety, and sometimes convulsions and death from breathing in fumes in well insulated workrooms producing felt (inspiration for the phrase, “mad as a hatter”) In the United States, the use of mercury in the felt industry was banned in 1941. But did you know that mercury continues to be used as a component in dyestuffs and as a catalyst in the dyeing process? Mercury is one of those “heavy metals” that you sometimes see referred to in relation to textile dyes. So the wastewater from mills which use dyestuffs containing mercury are contributing to mercury in our waters, where it enters fish and shellfish. Yet another reason to insist that the fabrics you buy are produced at mills where the wastewater is treated before release. People are exposed to methylmercury almost entirely by eating contaminated fish and wildlife that are at the top of aquatic foodchains. And as Rachel Carson demonstrated with pesticides, as mercury moves up through the food chain, its toxicity is magnified ten times until, finally, it reaches your dinner plate. Prior to 1950, not much was known about mercury poisoning. But then in Minamata, Japan an extraordinary confluence of events gave us an example of what can happen if a food source is contaminated. “The Minamata case is such a vivid example because the town and the bay where the mercury was dumped may be seen as a relatively closed system. 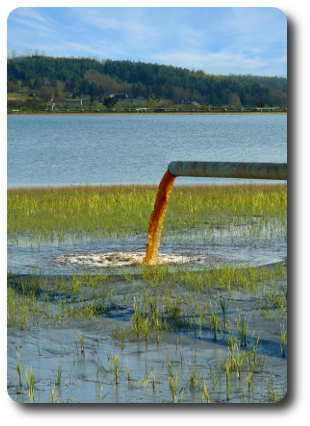 The ecological consequences, which are often diffuse and indirect, may be seen as a closed loop: the effects of the effluent led gradually but nevertheless inevitably back to humans. That is, in this exceptional case, one can trace the mercury from its source in Chisso’s production process, through the waste water to the organisms inhabiting the bay, and then to the cats or humans consuming the fish and shellfish. 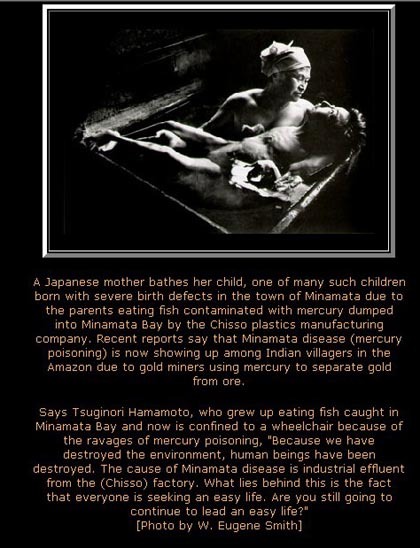 As a microcosm, Minamata illustrates the sometimes fuzzy concept that humans and their environment are inextricably interconnected.” You can read more about the Minamata disaster here. Disasters such as the massive release of methyl isocyanate gas from Union Carbide plant’s in Bhopal, India, certainly focus our attention on the adverse human effects and environmental risks of some industry. Yet such “incidents,” like those at Three Mile Island, Chernobyl or the Valdez oil spill can also be dismissed as “accidents” or exceptional single occurences–not as symptomatic of the status of human ecology. One can easily forget the often larger threats posed by low-level but more sustained release of chemicals–the “slow-motion Bhopals.” And one can easily overlook the more difficult, yet far more fundamental issues involving attitudes, lifestyles, and economic and social forces–issues that are so sharply profiled by the history of Minamata. Today in America, according to PBS, one in six children born every year have been exposed to mercury levels so high that they are potentially at risk for learning disabilities and motor skill impairment and short-term memory loss. The EPA has published threshold limits for what it considers a safe amount of mercury ingestion – known as a “reference dose”, which is dependent on body weight. EPA’s methylmercury reference dose is .1 micrograms per kg of body weight per day. Multiply child’s body weight by EPA’s reference dose. EPA RECOMMENDED LEVEL = 2.05 micrograms per day = 14.35 micrograms per week. Step 2 – HOW MUCH MERCURY IS IN 6 OUNCES OF CHUNK WHITE TUNA? Multiply amount of fish by average mercury level for chunk white albacore. By eating 6 ounces of chunk white tuna a week, the child is ingesting almost FOUR times the EPA’s recommended dose. GotMercury.org, which works to protect the public from mercury poisoning, in conjunction with scientists, medical doctors and consumer advocates wrote to the FDA and EPA in June 2010 urging them to strengthen the Federal fish consumption advisory for mercury and also to do a better job of warning consumers. “Mercury contamination of seafood is a widespread public health problem and eating fish shouldn’t be a toxic gamble. The government can and should do more to protect consumers,” said Buffy Martin Tarbox of GotMercury.org. According to “The Cove,” the FDA has failed to do their due-diligence in warning the general public of the dangers of mercury, primarily in women and children. Yet fish consumption advisories can only be an interim solution. The long-term solution should be the restoration of the chemical integrity of our ecosystem so we don’t have to refer to our crib sheets each time we want to eat fish. But there may be a bright light, literally, at the end of this tunnel: although they don’t know HOW it works, scientists have found that a combination of iron and sunlight destroys almost 90% of methylmercury that enters Alaskan lakes each year. Read more about that here. ADDENDUM: In addition to being toxic for humans, tuna, swordfish, and many other fish are caught in ways that are devastating ocean habitats and fisheries. Longline fishing, the destructive fishing method often used to catch tuna and swordfish, kills thousands of endangered sea turtles per year. Many of the fish species listed in mercury calculators are overfished, endangered, or being caught using unsustainable fishing methods. If you would like more information about sustainable seafood, please check out the Monterey Bay Aquarium and NRDC websites. Average for Chunk White Canned Tuna. Yess, Norma J. “US Food and Drug Administration Survey of Methyl Mercury in Canned Tuna,” Journal of AOAC International, Vol. 76, No. 1, 1993, pp. 36-38.